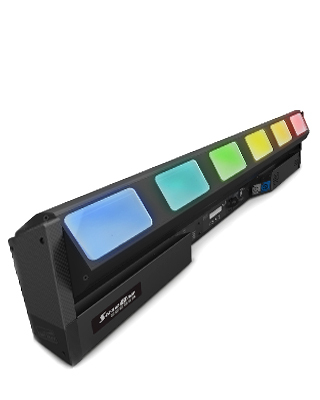 The SharBar is an advanced moving LED bar with features that transform it into a brand new multi-beam effect light. It fits six brand new powerful OSRAM Ostar RGBW LEDs with a power rating of 30W, but taking up the same amount of space as an old 10W LED. It is equipped with a motorized optical zoom capable of a minimum beam angle of only 2°. Thanks to its extraordinary lenses, the Shar-Bar is able to produce six very narrow, dense light beams, shooting parallel rays of light into the air. No comparable LED bar is able to produce a similar effect. The Shar-Bar may also be used to create sharp effects even when projected onto a surface. But there is an even more surprising feature! The optical unit coupled to each LED consists of a motorized system with double mirror. This means each beam of light may be directed independently of the others, thus adding a further degree of freedom to the bar besides the tilt. Each of the six light beams can move or be locked within a 60° (+/-30°) cone. Thanks to this ingenious, original optical unit, the LED bar produces an effect similar to six separate lights, which can work synchronously or asynchronously with respect to each other. Featuring even RGBW color mixing, linear CTO, 0-100% dimmer and 24 Hz strobe, the Shar-Bar produces truly innovative lighting effects and stands out for its high light output and extremely concentrated or diffuse beam. It is compact and durable, and weighs only 15 Kg (33 lbs). •Motorised LED batten •6 x 30W Ostar Osram LEDs •2° minimum beam angle •Very sharp mid-air beam effects •Sharp effect projections •Independent movement of each beam over 60° •Synch or asynchronous beams •240° motorized tilt in 0,2 seconds •Individual RGBW control of each LED •CTO on dedicated channel •16-bit dimmer and 24 Hz strobe •DMX, ARTNET on Ethernet.